Sindhi cuisine is very delightful and tasty cuisine which shows great deal of flavors and spices from sindhi culture. Sindhi cuisine is not just spicy but you can taste sweet recipes also. Sindhi cuisine is combination of Sindh and Punjab cuisine and flavors. So today I tried to make very interesting and tasty Sindhi recipe i.e. Seyal Phulka or You can say Sahelmani. Seyal Phulka is a flavorful leftover roti which includes stuffing of onion, tomato, ginger and spices. This is a popular Sindhi breakfast and also a popular and easy way to make use of leftover rotis (or phulkas or chapatis or even bread). For this recipe you have to do just stuff the leftover roti or paratha with tomato and onion tadka and cook on tawa till to crisp. It’s a perfect option for Sunday brunch with tea or coffee. 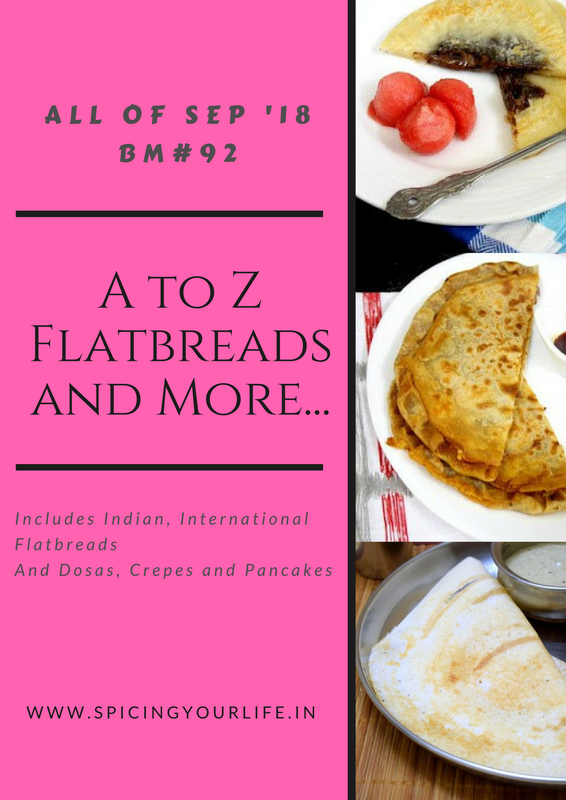 For 5th day, my letter is E and I choose Easy Seyal Phulka recipe for A-Z Indian Flatbread Series which hosted by Spice Your Life blog. Heat oil in a non-stick pan, add cumin seeds. When they start crackle, add onion, ginger and chili and saute 2 minute. Add tomato and spices and cook for 2-3 minutes. Add coriander leaves and 1 tsp. of lemon juice and mix well. Keep aside to cool. Take a roti and spread the stuffing in half portion and fold it. Spread again stuffing in half portion and fold it into 1/4 shape like triangle. Heat the tawa and cook the stuffed roti till to crisp and golden on both sides using little oil. Serve along with cup of tea or coffee. Seyal Phulka is a popular Sindhi breakfast and also a popular and easy way to make use of leftover rotis (or phulkas or chapatis or even bread). Heat oil in a non-stick pan, add cumin seeds. When they start crackle, add onion, ginger and chili and saute 2 minute. Add tomato and spices and cook for 2-3 minutes. Add coriander leaves and 1 tsp. of lemon juice and mix well. Keep aside to cool. Take a roti and spread the stuffing in half portion and fold it. Spread again stuffing in half portion and fold it into 1/4 shape like triangle. Heat the tawa and cook the stuffed roti till to crisp and golden on both sides using little oil. Serve along with cup of tea or coffee. What a delicious way to use up leftover rotis!! Lovely recipe….bookmarking it!! That is a gorgeous roti you have made with left over. The filling sounds wonderful and I wouldn’t mind if someone serves this for my breakfast.. Interesting. It is a distant cousin of quesadilla 🙂 Good choice, Preeti. That’s the tasteful and easy method to use leftover rotis. Loving it. Wonderful pick from Sindhi cuisine . And very well made too . We make these almost in the similar manner except that we add lots of coriander leaves ( pounded ) . Wow, this sayel phulka is definitely one of the best way to finish the leftover rotis. And the filling sounds ultimate and prefect to have without any side dish. I have been wanting to make this forever, wonderful use of leftover rotis and I am sure it tastes fantastic! Such a delicious way to make use of left over paratha! The leftovers will disappear in minutes! Nice choice for the alphabet Preeti! SUch a great recipe to use leftover rotis. I have never heard of this and I am bookmarking this to make next time. what an idea using leftover roti. Loved this recipe and looks fabulous.